A 200 - year legacy that focused on the individual & the society to build a healthier, progressive community. Innovative processes that adopt the best technology & yet stay traditional. 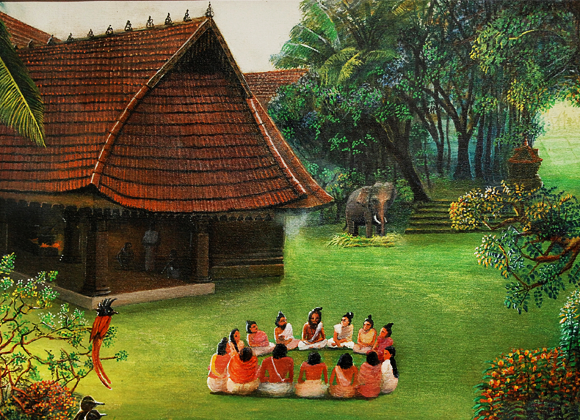 A unique Ayurvedic culture and traditional knowledge center of Ayurveda since the18th century. GMP Certified manufacturing unit for traditional Ayurvedic medicines. Itoozhi Ayurveda illam became renowned as a center in Malabar for holistic healing, based on ancient and proven Ayurvedic treatises, at the beginning of the 18th century. The tradition dates back to the eight vaidyas ( Ayurvedic Physicians ) who made our illam their home, each specialized in a different branch of the ancient science of treatment, and began to treat and heal the thriving community of Malabar. Itoozhi Vaidhyas are also one of the few families who are considered authentic Ayurveda Nethra Chikitsakas ( Traditional Ayurvedic Eye Physicians ) in Kerala. Itoozhi Ayurveda has a dedicated Ayurvedic Eye Clinic for Ayurvedic eye treatment that employs traditional Ayurvedic procedures for improving vision, strengthening of ocular tissues and enhancing the visual beauty quotient and general appearance. The increased urbanisation of the population have thrown up surprising yet, not that unexpected mitigating factors that come together as major causative influences that lead to infertility. Some of them include fast food, driving, traffic pollution, increased use of laptops, mobile phones, pesticides, smoking , over eating and the increasing deterioration of quality the consumption of sea food. Panchkarma comprises five distinct therapeutic procedures. Each procedure has an importance in our body. That is why utmost care is exercised at Itoozhi Nursing Home while performing Panchakarma on patients. Regeneration and rejuvenation is mutually inclusive in holistic healing through Ayurveda. Based on the fundamentals of Rasayana, the effort is to restore the intelligence that guides the body's natural regeneration and rejuvenation. Itoozhi Vaidyar Dr.I.Bhavadasan Namboothiri feicitated by Minister for Ayush, Sri Shripad Yasho Naik on the occasion of Silver Jubilee celebrations of the National Ayurveda Academy at New Delhi. Dr Manoj Nesary (Adviser AYUSH), Padmabhushan Devendra Thriguna, Dr.R.Chidambaram – Principal Scientific Advisor to the Govt of India were also present on stage for the felicitation ceremony. The launch of AyurVision Ayurveda Magazine was held at the Standardisation of Kashayam Worksop inaugural event. A workshop on the standardisation of Ayurveda was organised by the Itoozhi Illam Ayurveda Foundation Charitable Trust on 18 July 2014.